First of all I want to thank everybody who provided feedback for Nordenfelt 0.4. The overall response was quite positive. One important lesson I’ve learned from feedback so far is that tastes are different. This fact makes evaluating replies sometimes difficult. Finally it is important to have an own position and learn which opinions can and should be ignored. Otherwise there is little chance to get such a project done. Anyway, thanks to all of you. I’m appreciating the effort you expended in testing my game. Thanks a lot! Version 0.4 was an important milestone. It marked the end of the engine demo phase. Nearly a year of writing the engine was too long for my taste. This experience belongs to the category “if I only had known…”. In case of a sequel of Nordenfelt I’ll exploit this engine as much as I can. That should distribute last year’s effort over one more project. But that’s all still up in the air. The next few months are dedicated to making the game itself. Thrilling times ahead. Many shoot ’em ups have a rank systems. It can be imagined as some kind of automatic difficulty adjustment. For example when the player beefs his/her weapon up to a high level the enemies start to get angrier, faster and stronger. This way the player is kept challenged. Experienced players exploit the rank system by keeping their equipment levels low. There are many more aspects in the game which influence the rank system. Figuring out what affects the rank is essential for beating the game as well as the highscore. This should be self-explanatory: get the best score, on your machine or online. There will be a few types of equipment like bombs or bots which can be used for strategical play. Each game level is different and therefore should be tackled with appropriate equipment. Equipment can be upgraded throughout the levels. This makes your ship stronger but also affects the rank (speak difficulty). Only equipment mounted on your ship will be upgraded in levels. Therefore you have to choose wisely what to take with you in each level. Here We Go: Nordenfelt 0.3 Arrived! Simply download the game, unzip it (e.g. with 7-zip) and start Nordenfelt.exe. As usual there is nothing to install and the game can be deleted any time without hassle. Drop me a line what you think. I’m looking forward to your feedback. I dismissed blogging because I vowed myself to not write anything before version 0.3 is out. That was in the last week of October. Time flies when you’re having fun! See you next post, very soon. Nordenfelt 0.3 is coming and it will have a new level and new enemies. The whole procedure of designing/modeling/texturing/rendering of level parts and enemies is sooo time consuming. These tasks are millstones around the neck in times of feature testing. Therefore I’ve entered “MS Paint mode” (again). Rule of thumb: graphics must be as simple as possible but have to represent the intention. The primitive shapes and gaudy colors may bring you eye cancer. But hey, they are functional! Improved test graphics won’t be as distinguishable and may be kept in the game forever for compromise. These ugly geometrics will never survive ’til final release. Critics would eat me alive! The testing focus of version 0.3 lies on gameplay. Graphics will follow – in beta versions, starting before 2011 (hopefully). The release of Nordenfelt 0.2 was well received and got nice feedback. There were many feature suggestions and questions if the game will have feature X or support Y. I’ve caught myself answering the same questions over and over again. Therefore I’ve decided to compile a FAQ list about Nordenfelt. You can read it here or find its link in the site’s main menu in the top right corner. Which features will Nordenfelt have? … where you are going to shoot steampunkish vehicles and machinery. This is the well known quest through a series of levels shooting planes, tanks, ships and other vehicles. A boss will await you at the end of each level. Upgrades and goodies will improve your ship throughout the flight. This mode has a deeper game play depth regarding equipment and missions. 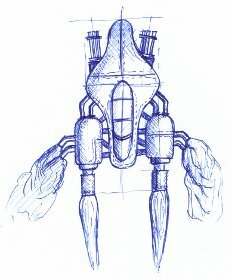 You will have a hangar full of air ships with various equipment, an R&D section and strategical missions with different goals. Which platforms will you support? No, it will be shareware. A free demo version will be available for download. If you like it I would be happy if you consider buying the full game. How much will the full game cost? The price will lie between 10$ and 20$. The final price is still a point at issue. Latest on Doomsday – 1, which is 20th of December, 2012. A homebrewn one. I’m just using a few free libraries like SFML or BOOST as foundation. For me the most surprising fact was that it was totally unclear that Nordenfelt won’t be free. It’s an understandable assumption due to the sheer amount of free stuff on the internet. Nonetheless I have to make a living from it. Quality will have to legitimate the price tag. So I’m going for it. After collecting all feedback from version 0.1 the first point on the todo list became including upgrades in the arcade mode. That sounded simple. 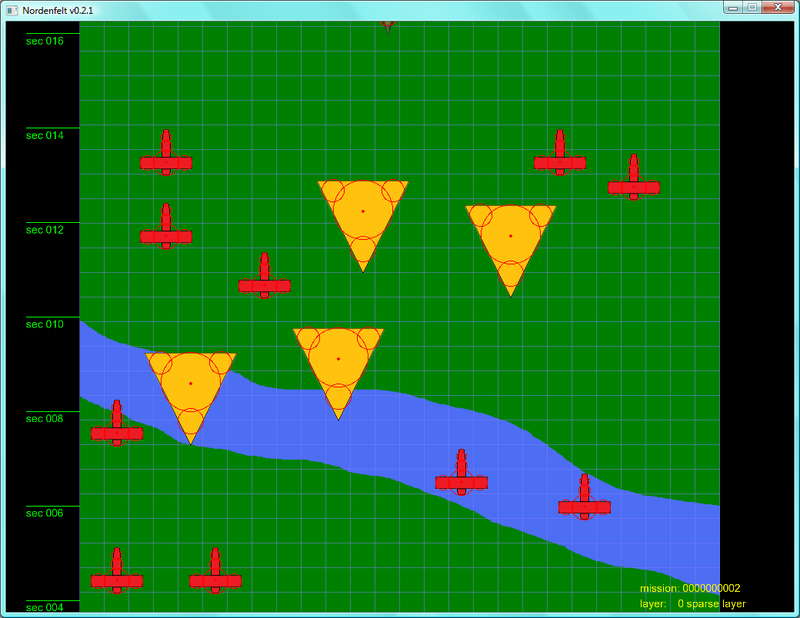 I added a new upgrade object type and integrated it into the collision detection system. Here the first problem popped up: Physical shapes were still represented as polygons, upgrade icons were going to be circular. There was a big “TODO: replace polygons with circles” in the code. OK, let’s replace the polygons with circles. I will have to do it anyway. The avalanche started sliding. While refactoring the collision code and adapting file formats the latter became painful work. The data formats were simple sequences of numeric values. E.g. a 2D vector was just a pair of numbers and a circle was a 2D vector followed by the circle its radius. The lack of meta data within the files, declaring the meanings of the values, forced me to always reference the corresponding loading source code. That was cumbersome so it was time for the next refactoring step: replacing the old file formats with XML. Next job in the refactoring queue. The newly integrated upgrades had to load their data from files. They needed sprites, animations and body shapes. The third refactoring The Game The Face Of L.A. job accelerated the avalanche. Hey, I just wanted to upgrade my guns! Oh, wait a minute… equipment needs new upgrade definitions, weapons will have different shoot layouts. Dammit! Next job enqueued! 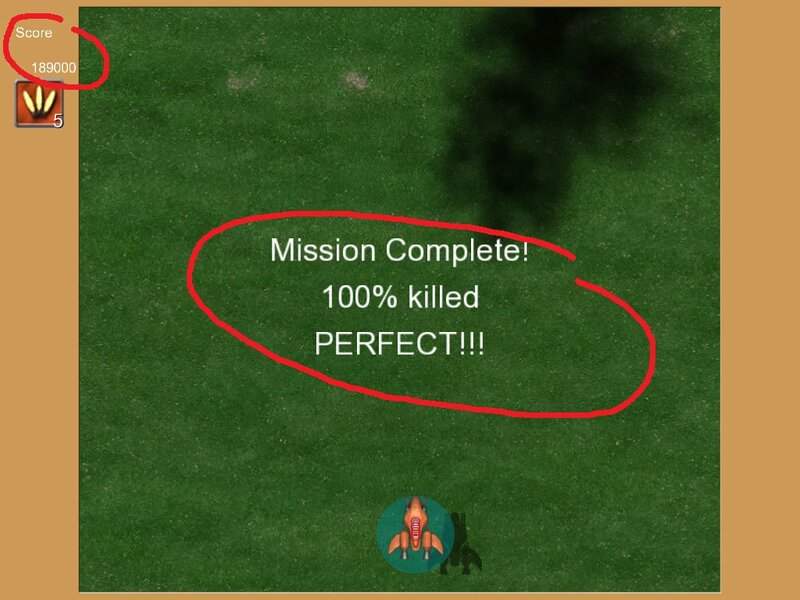 After two weeks refactoring the hell out of the game all viral tasks were finished. It’s a good feeling that the Nordenfelt engine now has proper data formats, a faster collision detection and upgradable equipment. Now I can go on with the funnier things. 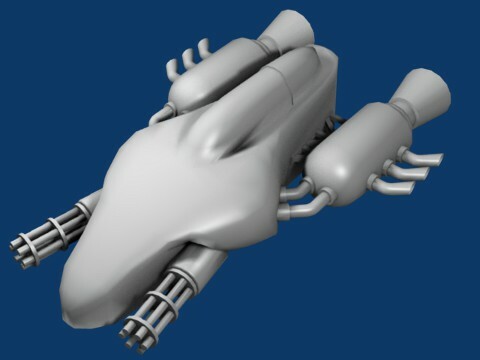 For example modelling the player ship.